The Word One of Victoria's wimpy limestone offerings. Best Route(s) Avignon (** 20), Le Sud de Vic (*** 27) - both marked in the photo below. Wet weather options If you can brave the wet walk-in, there's a chance some routes might stay dry. Style of Climbs Mainly sport, but bring a rack. Access: 15min walk plus a wade, or a 25min walk. It's a 5min drive from Buchan along the Orbost Rd, ~4hrs drive from Melbourne. Drive 6.2kms from Buchan towards Orbost, where a wooden bridge crosses the Buchan River. You will have already noticed the crag off to the right across the fields and the river. You can walk from the closest point on the road direct towards the crag, which requires wading the river (which flows strongly after rain - not recommended). For this access, ask permission at the farmhouse on the left just before the bridge for permission to cross the land on the road side of the river, AND ask at Amberley Park (3kms past the bridge on the R), for permission to enter the land on the far side of the river. Alternatively, you can avoid the wade by parking just over the bridge and walking 25mins back up the river (initially staying high to avoid some scrub), which takes you past Englishman's Castle. You only need permission from Amberley Park this way. Either way you'll have to dodge some blackberries, jump a few electric fences and greet a few cows. Above Right: Here's the view as you approach from Buchan. 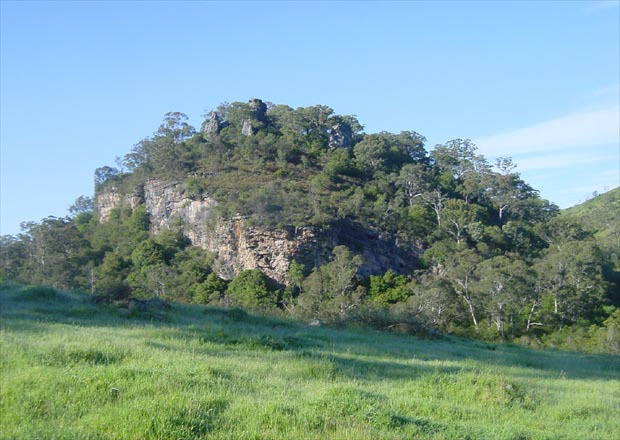 Englishman's Castle is hidden, directly behind the outcrop. 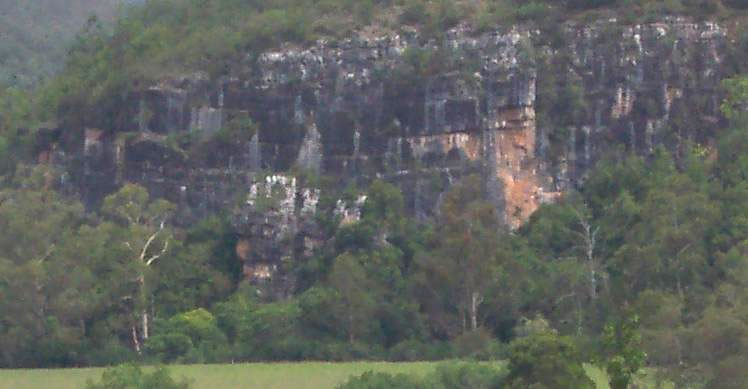 Described L to R, facing the cliff. Right: Armchair Flat, with 4 routes marked (Click To Enlarge). Looks sort of ok but a total misnomer - it's pretty pathetic in comparison to the real thing, given it doesn't have the massive exposure, great views, perfect rock, or 10 more pitches! 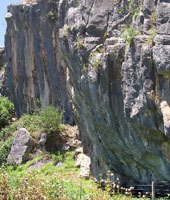 (It's the left arête of the main wall, marked in the photo below). A lovely steep sustained stemming problem, overhung by about 1m. Not sure why the guide would give it 22 - that's way off. Start just L of the central corner of the crag, then step R to start stemming below the second bolt and up you go. 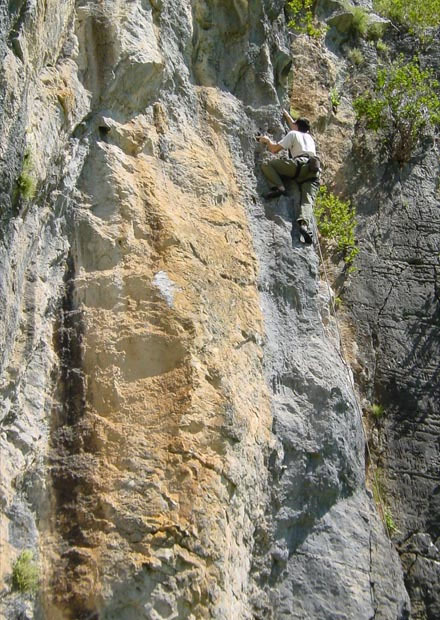 The lower off is badly positioned and pinches your rope against the rock - extend it if others are going to follow. My rope is visible on it in the photos on the R and below. Marked in the photo on the R. One star at most. High 1st RB (#1.5Fr possible below), then step up L onto the bulge and meander up the thin arete above past several uninspiring holds. A nice steep juggy finish is all that earns the star. The warm up - unfortunately its very ordinary. Start as for VlV (clip its RB if you like), then trend R up the slabby crack with good pro to the small bush. Mediocre wires on the R protect the moves up the small corner above to the lower off. The route description for Slunt on Slunt Wall matches this route perfectly (except that I'd give this route 15 rather than 14) - see the 2002 Eastern Victoria guide p335. 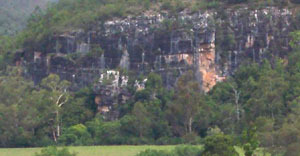 Above Right: Here's another view of the crag, showing how steep the right end is. Too bad the holds have all come off. Below Right: Nick on Vous Le Vu (19). Access to this cliff was fairly dodgy. Four barbed wire fences (one electric that I found out the hard way! ), a waist deep creek and quite a few nettles finally get you to the cliff. It takes about 20 minutes to walk in. The area is very rural. Instead of natural bushland it’s all weeds and cow manure with the occasional rabbit. The limestone wasn't the greatest quality and some of it crumbled quite alarmingly. Matt seems to have done an excellent job of bolting the routes, all being ringbolted with rap anchors. There is NO potential for new lines on this small cliff. 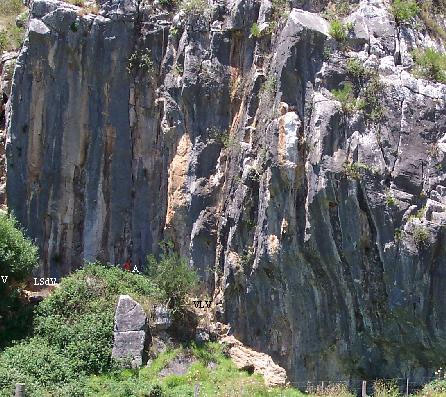 All the routes are about 15m high on slightly overhung rock. By far the best line there is 'Verdonesque' 15m 24. If you were giving stars to routes only at Buchan including the Pyramids than this would get three stars. Its an excellent knife edge arete on small pockets and edges. I thought 24 was a sandbag grade. More like sustained 25. The route 'Avignon' was also quite good, but it was much closer to grade 20 than 22. Nick and I found it no harder than its neighbor Vous Le Vu (19). Amadeus (21) felt about right with its grade. Overall it’s a nice little area with shade in the morning and some nice green grass to chill on. It would keep you entertained for a day at max. After opening and closing EIGHT gates on the private road to get this area we finally got stopped by a locked gate with a Private Property sign. We got permission (reluctantly) from the owner and walked across his flat to the base of the hill. The lower cliff had very little potential for new routes but did contain the greatest amount of wasp’s nest I have ever seen. We then thrashed our way up to the Pyramids proper (is there a track???). The area was nice and tranquil with a few good lines. Nothing really stood out apart from the Carrigan routes described as 'hand cracks' in the guide. They are more like subtle finger crack weaknesses. You certainly wouldn't be jamming up them! Nick and I both had a go on Matt Brooks 'The Egyptian' 26/27. The line is well bolted in a great position but the rock is very bad. Nick and both took plummets from exploding hand and footholds and it only seemed to get worse the higher we went. NOT classic climbing. The grade seems suss also. More like 25. The loweroff ringbolts at the top are not in a safe enough position to be used to rap off other routes on this pillar. Above Right: 370km, 8 Gates and numerous sheep we finally got to the Pyramids, the so called 'best limestone in Victoria'. Below Right: The secret sinkhole crag located behind the Pyramids. Three hundred metres of head hieght stinging nettles guard its pleasures. Below Far Right: Nick on the The Egyption (26), a crumbly sport route at the Pyramids. We then went and checked out the Sinkhole crag located directly behind the Pyramids. Matt Brooks has been hard at work here also it seems. There are three ringbolted bolted projects about the same vintage as 'The Egyptian'. It looks like he just bolted them, and has not been back to try them since. There still seems to be a fair bit of loose rock around. The bottom of this area is INFESTED with head height nettles, which makes this a far from pleasant area to climb at. We wore full-length pants and tops and had to beat our way in with big sticks. We spotted a few more good hard lines on nice rock but by then we had had enough. No ones going to visit a cliff 370km from Melbourne, with eight gates to get there, a 30min slog up a weed infested hill and completely filled with nettles. The caving is good though! About 500m downstream from the Amphitheatre, these two outcrops look deserving of some more attention. Drive 10mins N out of Buchan, turn R into Shaw's Gully Road. There's more crags downstream but the private property access gets more problematic. This shot shows Farm House Wall, which is actually visible from the main road anyway. Looks quite ok from a distance. 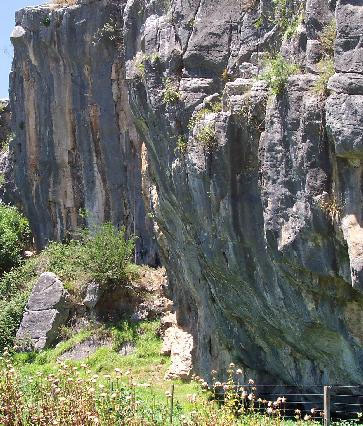 This popular caving area seems to have been visited by some deranged bolter who has 'established' at least six routes on the rocks walls on the outside of the cave entrance. Since there is a large sign stating 'It is illegal to damage caves or karst features' just above the cliff this seems quite bad. The routes aren’t even that good and are very small and over bolted. The routes on the lower wall are particularly pathetic offerings. All of 5 meters high, they are easily bouldered with a crash mat. The bolts are excellent and very new looking (a year old?). Glue in rings and European expansion bolts. The slightly better routes are actually located INSIDE the entrance to the main cave. These are on good rock and have some bolts that look about 5-10 years old. Will's Climbing Pages - Same details, from the original source. Neil's Trip Report - Details, photos, etc. 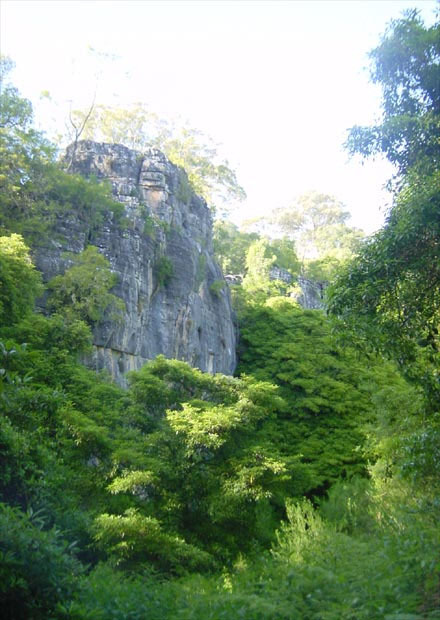 Buchan Caves Reserve - From Park's Victoria's web site.